We’re stunned at the wide variety of styles that can be produced from the Riesling grape. Still, sparkling, and everything in-between. Austere/dry, to cloyingly sweet. The Schloss Gobelsburg was slightly effervescent (not quite frizzante), and even reminiscent of Champagne in terms of its flavor. It started out extremely dry, fresh, crisp, tart, astringent, steely, and acidic. This doesn’t sound totally pleasant, but it honestly was very interesting. As it opened up, it still had a wet rock quality to it, but became creamy AND effervescent at the same time. I’ve no idea how that’s possible, but this was the rather wild experience. Layers and layers continued to happen, with its sweet, fruity secret finally being revealed in the last glass. I love it when a wine has this much complexity and variety of experiences. It’s like going on a cruise for vacation, rather than staying in one place for the week. Or, like That Friend who wears Prada and is reserved for a while but then she has all these cool sides to her once she opens up. 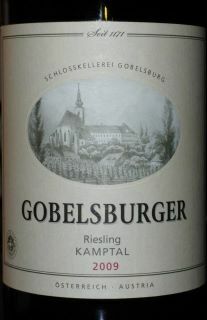 This entry was posted in Austria, Riesling. Bookmark the permalink.